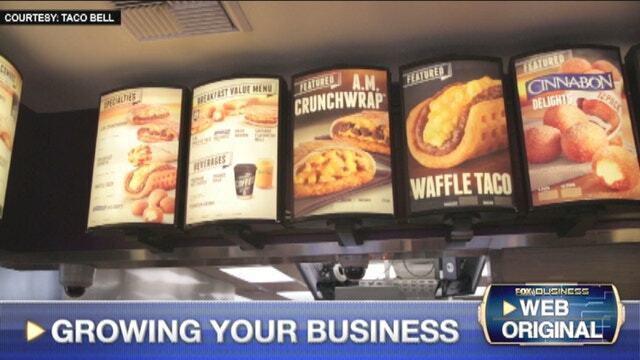 FOXBusiness.com’s Kate Rogers with Taco Bell President Brian Niccol on why the brand is shaking up its offerings at breakfast, with Waffle Tacos and more. When you think breakfast, Taco Bell likely isn’t the first thing to pop into your mind. But waffle tacos? Now we’re talking. The restaurant chain announced Thursday its new breakfast menu of 13 items including an A.M. Crunchwrap, Cinnabon Delights and more. President Brian Niccol says the fast-food chain was looking for a new way to find incremental opportunities to grow the business and had to move into early morning offerings, as breakfast is the only part of the quick-service restaurant industry that is seeing real growth. “We have been testing this for the past 2 to 3 years, and what we have discovered is our current customers are already eating breakfast in quick serve restaurants, and they have been asking us, ‘Why don’t you get in on the game?’” Niccol says. But getting them to choose Taco Bell in a sea of breakfast sandwich offerings won’t be easy. Niccol says the breakfast ad campaign is meant to “turn heads and steering wheels” toward the chain. One spot features “Ronald McDonald”—not the famous redheaded clown, but a different, real- life Taco Bell customer with the same famous name, giving his seal of approval. And Taco Bell’s quirky spin on staples, and unique partnerships with brands like Dorito’s for their Dorito’s Locos Tacos, has served the company well. While it is the underdog at parent company Yum Brands (NYSE: YUM), aside bigger brands Pizza Hut and KFC, Taco Bell is slowly becoming its key money-maker with more than 6,000 locations across the country and $7 billion in annual sales. Taco Bell fans can also expect a move into mobile ordering and payments in the near future, Niccol says, as its popularity with millennials continues to grow. And while overcoming flat growth trends in the quick-service industry is key, Niccol is confident Taco Bell will prevail. “The Taco Bell future is bright—we have a goal of taking the restaurant from $7 billion (in sales) to $14 billion over the next 10 years. We think doubling our business over the next decade is a real possibility,” he says.